The Golda Meir Library, University of Wisconsin-Milwaukee (UWM), houses the Américas Award Research Collection, over 400 U.S. published children’s and young adult books that portray Latin America, the Caribbean, or Latinos in the United States. The Américas Award, sponsored by CLASP, was coordinated by the UWM Center for Latin American and Caribbean Studies between 1993 and 2011, when the award coordination moved to Tulane and Vanderbilt Universities. 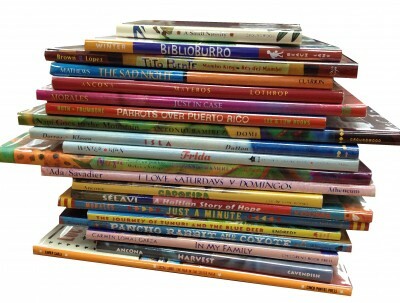 The collection, housed in the Curriculum Collection, includes all Américas winners, honor books, and commended titles since the award’s inception in 1993, and it will continue to grow with the addition of the annual list of titles. Although the research collection is non-circulating, the Library has circulating copies of most Américas titles, purchased for the Library by the UWM Center for Latin American and Caribbean Studies (CLACS). K-12 educators and researchers interested in using the collection are invited to contact Julie Kline (jkline@uwm.edu), CLACS Associate Director of the Center for Latin American and Caribbean Studies.